The captain of the Marianne av Göteborg, a boat participating in the Flotilla, is Joel Opperdoes from Sweden who has just turned 33. 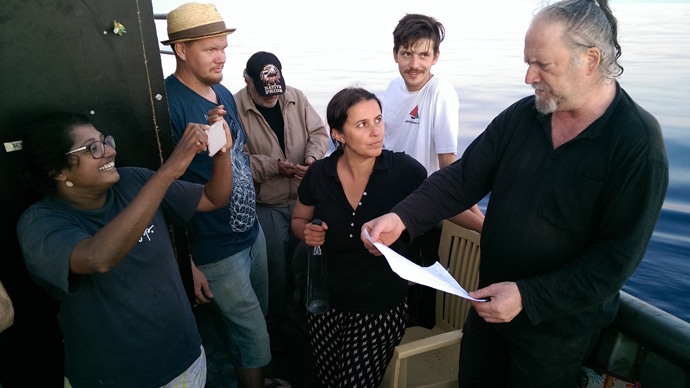 He celebrated it on board the ship two days ago with the crew, Flotilla participants and journalists. Joel has been at sea since he was 16, and now he captains big cargo ships.This May, he took a vacation from his job in order to join the Flotilla mission. His ship made it all the way from Norway to the neutral waters in the Mediterranean and is now waiting for the other ships to catch up. 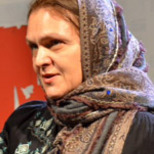 The trawler Marianne av Göteborg is named after Marianne Skoog, a veteran within the Swedish Palestine Solidarity movement, who died in May 2014. “My duty by law is to protect the ship against pirate attacks, and attacking a peaceful ship in neutral waters is the definition of piracy,” says the captain. “Our task is to maintain control of the ship and not to let it be taken over. We owe it to those Swedes who helped equip it. Yes, we are unarmed. But even unarmed people have a right to resist the piracy in a peaceful way,” says the captain. In 2012, Israel intercepted the Swedish-owned, Finnish-flagged boat, Estelle with pro-Palestinian activists – including Swedes - trying to break the blockade of the Gaza Strip. “Some might say: if you don’t want to be attacked, turn back. But we can’t turn back. The Palestinians are waiting for us, hoping for us to break through the blockade,” says Captain Joel. The flotilla’s start was sabotaged and delayed. The Juliano, docked in the port of Athens had its propeller blades bent, so they would crack the bilge when the boat started moving. So far it is the only boat damaged by somebody. The same thing happened in 2011. The ship is named after a director who opened a theater in the West Bank in 2006. The Freedom Theater is in the Jenin camp for Palestinian refugees. He staged Orwell’s Animal Farm and offended everybody. A man shot the director in the head when he was getting into his car. The killer was never found. Seventeen countries are represented in Freedom Flotilla III – the US, Israel, Germany, Finland, Spain, Greece, South Africa, New Zealand, Sweden, Norway, Tunisia, Turkey, Morocco, Jordan, Canada, the UK, and Russia. The flotilla has united people of all beliefs except racists, among them a former president, a Catholic nun, two writers, three parliamentarians, five reporters, a musician and six TV crews. About 60 people altogether on three or more boats. There will be no Palestinians onboard (except for the Israeli MP), because if they are captured, unlike all the other members, Palestinians would face many years in prison. It is the third flotilla. The previous one set sail in 2011. Back then nine ships in different ports had their blades damaged. The 2010 flotilla was attacked by Israel, when nine out of 650 activists were killed on the Mavi Marmara, and another one spent several years in a coma and died in May of 2014. No ship ever carried weapons or anything that would arm Gaza. The flotilla’s principle is to deny Gaza’s blockade, express peaceful disobedience and rally against pirate practices of capturing ships in neutral waters.